SkyRest is designed and manufactured by DAC Innovations Inc., based in San Jose, California. You may have seen SkyRest featured on your local news, or in the Sky Mall catalog on many planes. DAC Innovations also makes a cover for their pillow as well as the leguP bolster pillow. See how Skyrest compares on my best travel pillows page. While the SkyRest Travel Pillow packaging certainly had me intrigued, I was happily surprised to find the inflatable pillow truly comfortable. The shape of the pillow, with its sloped front and soft fabric, makes it easy to fall asleep while traveling, especially in a car or train. Similar to the Travelrest Ultimate Inflatable pillow, the SkyRest pillow is easy to pack away until you want to use it. The inflation device comes with detailed paper instructions (that are folded into the pillow when you first open it) as well as printed instructions on the pillow itself. The pillow easily deflates and the air nozzle is capable of holding air in as you blow it up, so you don’t lose air in between breaths. The instructions say to unfold the pillow into its cube shape, which will allow it to fill up with air on its own, from there they say you only need about half a dozen breaths to fill it up. Maybe I just have terrible lung capacity but it still took me roughly 15 breaths to fill up the pillow completely. But I was really happy that I could inflate it without having to worry about losing air between breaths. Which travel pillows are best? You cannot machine wash or dry the pillow, but you can hand wash it in a sink using mild soap. I would definitely recommend washing this pillow before use because I noticed a decent amount of blue dye transfer onto a wet paper towel that I rubbed over the pillow when I first inflated it. The pillow may shrink or balloon in size due to cabin pressure, so be sure to inflate it once the airplane has taken off. You can easily adjust the firmness of the pillow with the nozzle as well. A few notes about the size and shape of the pillow. 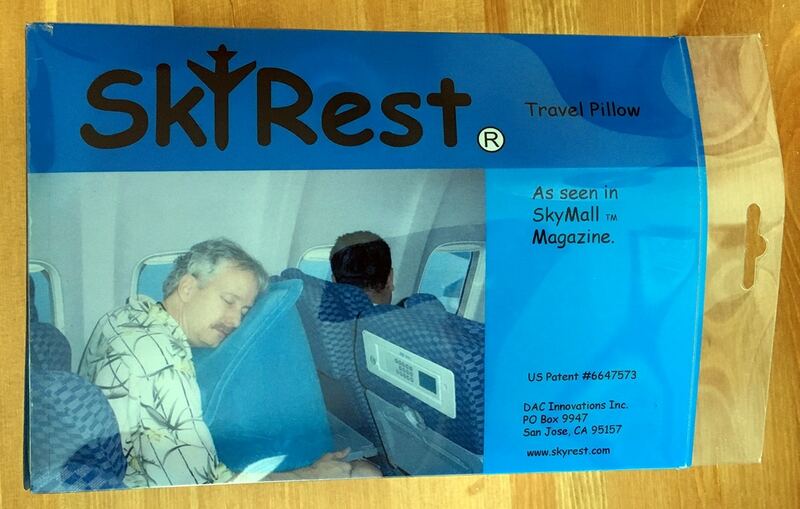 The SkyRest pillow packaging features a photo of a gentleman using the pillow on the folding tray on a plane. You can see pretty clearly that it is a big pillow. I personally feel like I would be hesitant to blow this up and use it unless I had no one sitting next to me, or was in an economy size seat or higher. I do think this pillow is probably a great fit for a car trip in the back seat. I would imagine this could be harmful if you are using it in a front seat and an air bag goes off in an accident. But in the back seat you can easily put it on your lap or lean it against a window and rest. You can also place the pillow under your feet. The sloped feature creates a nice angle to rest your feet and legs. Others used their pillow as a back bolster in bed, as well. The pillow also comes with pockets for you to rest your hands and arms in while using the pillow. You end up looking like you are hugging the pillow when using it, but having a place to put your hands was a nice option in my experience. Individuals who naturally sleep on their stomachs may benefit from this pillow (and the Ostrich Pillow as well). 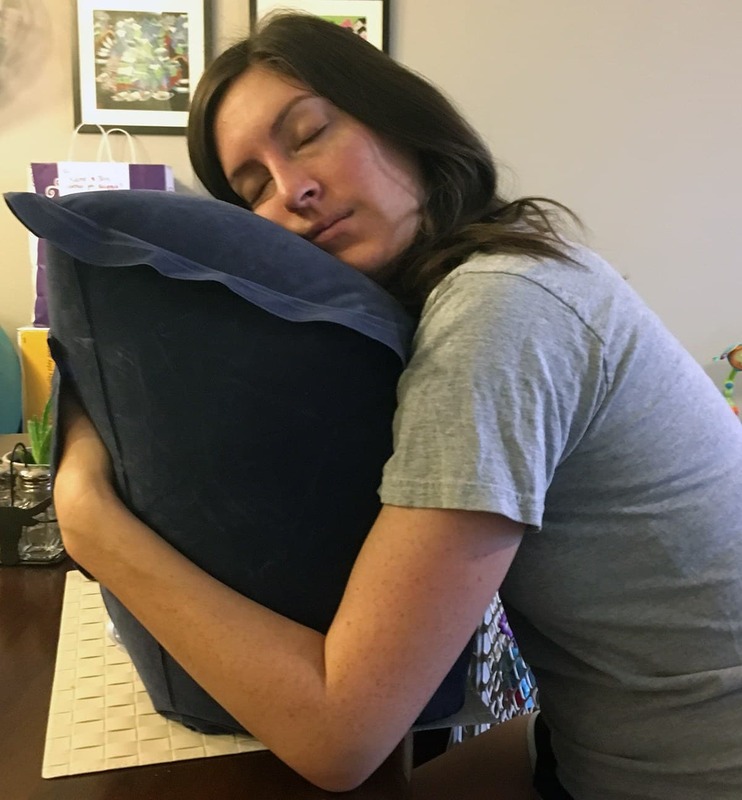 I think this pillow can provide comfort on longer flights or train/car trips where they would like to get as much rest as possible. 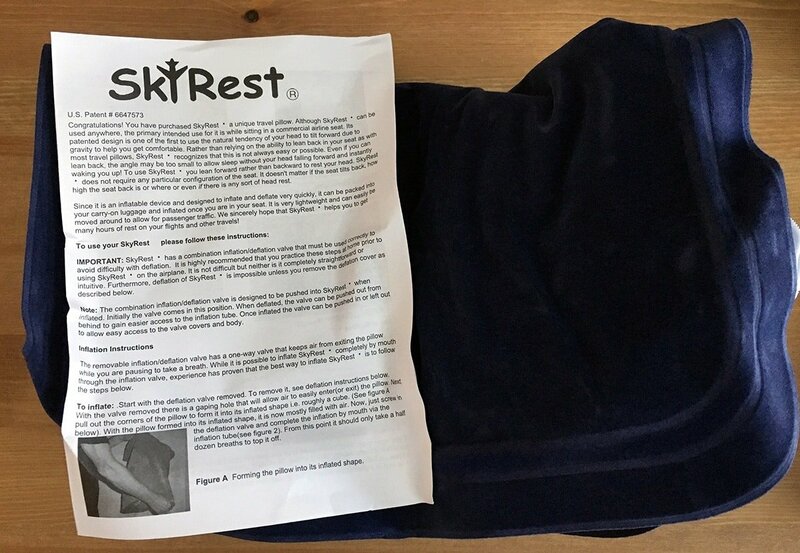 Overall the SkyRest Travel Pillow is comfortable and especially good for trips where there is space to fully inflate the pillow. 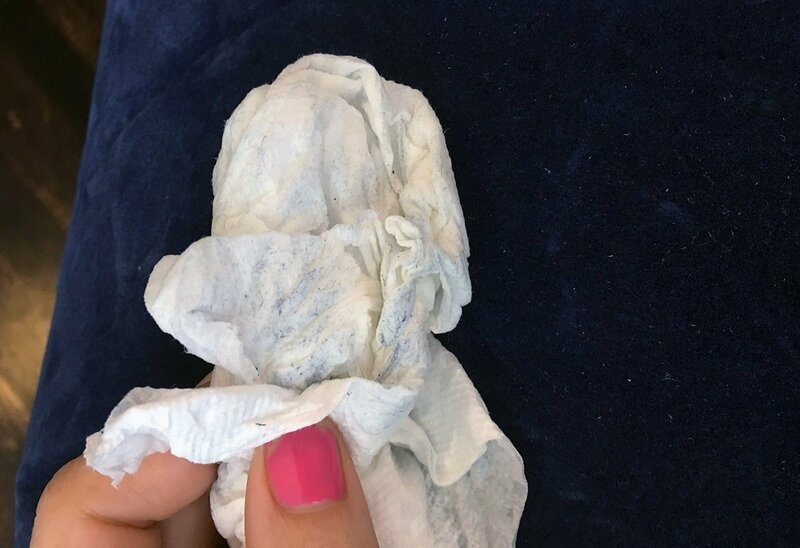 It is not machine washable or dryer-friendly but can be hand washed in a sink. It is easy to inflate and deflate and compacts into a small size for travel. Reviewers found it tight in economy seating and I can understand why. The pillow takes up a good amount of space in front of you and your arms need to wrap around the sides, so there is a chance you’d interfere in other’s personal space. One passenger said it turned on the touch screen TV in his seat and the brightness of the screen interrupted his rest. SkyRest says that certain airlines may not allow you to use the pillow in an emergency exit row and to check with a flight attendant before being seated to ensure you can use the pillow. The dye does transfer so wash in a sink with mild soap before use (especially if you’re planning to wear light clothing). You would need to feel comfortable inflating this and using it in public. It is fairly large so I would imagine you would draw some attention to yourself while using it. You can purchase the SkyRest pillow off their website for $29.95. It is also available on Amazon for the same price. I think for the right trip, this pillow would be a great investment. 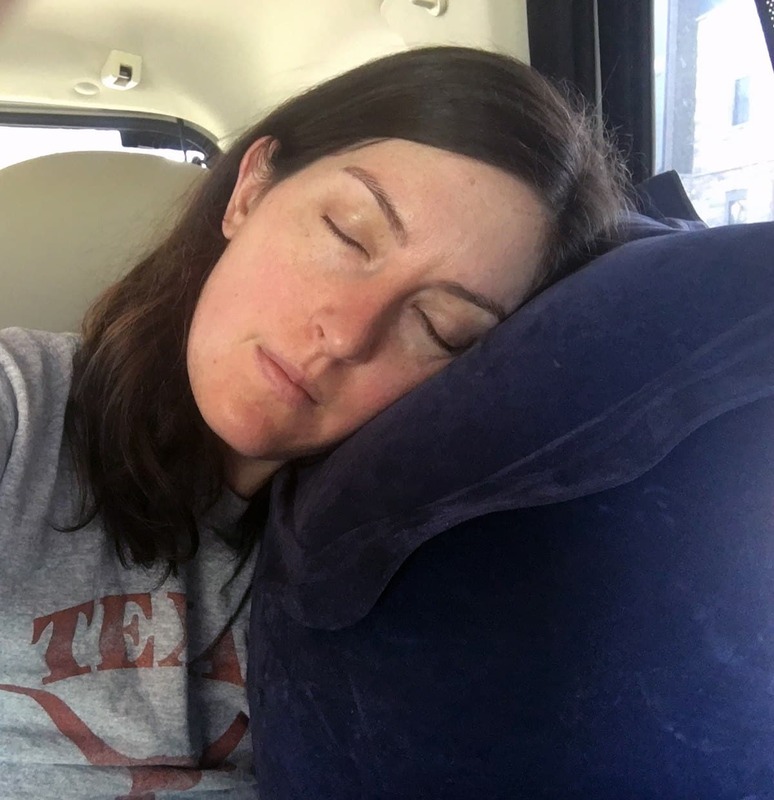 If you are comfortable sleeping on your stomach, have a long trip ahead and plenty of space around you (large airplane seat or roomy car/train space) then it is possible to really enjoy this pillow and get rest. I would not recommend this pillow for tight spaces.